China, despite its key role in Central Asia’s economy, remains aloof to military issues, not wanting to engage in conflict with Russia. Russia remains the principal partner for Central Asia’s armed forces. 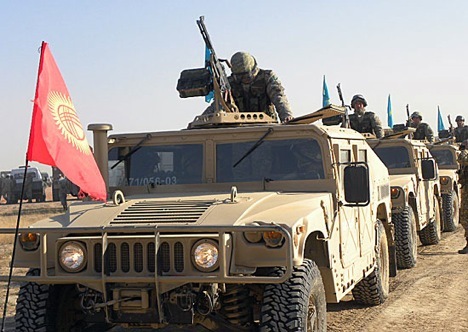 According to research carried out by Dmitriy Gorenburg , an analyst at the Stockholm International Peace Research Institute (SIPRI) titled ‘External Support for the Military and Security Forces of Central Asia,’ Moscow’s influence in this region can only grow once NATO and U.S. Forces have withdrawn from Afghanistan. In the analyst’s opinion, despite increased spending on the military, only Kazakhstan and Uzbekistan are in the process of forming a combat capable military, while Kyrgyzstan and Tajikistan have difficulty in forming even small, rapid reaction corps. Tajikistan’s problems stem from a lack of specialists that are capable of developing a plan for structural reform of the nation’s armed forces. The SIPRI report’s author thinks that the external threat from radical extremists is real, however it is exaggerated on a regular basis by both local security forces, and their Russian partners. Dmitriy Gorenburg says that the main issue for the ruling regimes in Central Asia is internal unrest and instability. Turkey is attempting to establish contacts in the region with mixed success, and furthermore India is looking to do the same in Tajikistan. China, despite its key role in Central Asia’s economy remains aloof to military issues, not wanting to engage in conflict with Russia. The report notes that Europe’s defence industry is of interest to local regimes with the money to purchase new weapons. During military operations in Afghanistan the U.S. remained an influential player in the region, not necessarily by offering assistance with military hardware, but by providing education and training programmes for local forces. Gorenburg forecasts that the withdrawal of the Coalition and NATO forces from Afghanistan will leave Central Asia’s leaders alone to face a series of threats, since the majority of them are not capable of developing armed forces that meet international standards. Russia meanwhile remains the principal source of external support to Central Asian nations, supplying not only armaments, but also training local servicemen, modernising obsolete technology, and offering financial assistance. Kazakhstan has established a fruitful partnership with Russia and has one of the most stable economies in the region. The country is looking to develop modern armed forces. The first bilateral deals to procure armaments were for the Kazakh Air Force. At the end of the 1990s, Kazakhstan purchased 14 Su-25 ground attack aircraft, 12 Mig-29 fighters and a number of training aircraft from its Russian partners. Today Russia plays an active role in modernising the Kazakh Air Force. Between 2004 and 2011 Kazakhstan acquired 47 Mi-17 helicopters (including modified variants). In recent years however Kazakh leaders have shown an interest in helicopters produced by European manufacturers. They continue to acquire Russian armoured personnel carriers, and contracts to supply 190 BTR-82A vehicles were signed in 2010 and 2012. Kazakhstan also became the first overseas customer for the experimental BMPT (armoured tank support vehicle) known as the ‘Terminator’: the first three vehicles were delivered in 2011 and a contract for a further 9 such terminators was subsequently signed. The same year three TOS-1 Buratino vehicles were commissioned by the Kazakh Army (this is a heavy multiple rocket launching flame thrower system based on the T-72 tank). In January 2012 Russia and Kazakhstan signed an agreement on a unified air defence system. Under this agreement the Kazakhs are due to receive the S-300PS missile defence complex, a modification of the S-300, production of which has now ceased. The Kazakh Navy is at last building Katran missile boats developed by Russian designers from the TMKB Almaz (Central Naval Design Bureau) in their own shipyards. Two of these vessels have been launched in recent years. Practically all the country’s armed forces are of Russian or Soviet origin, but the Uzbek government is not carrying out as active a modernisation of its own army like Kazakhstan. Since 2000, Tashkent has been procuring Russian rifles, including machine guns and sniper rifles. In the 1990s around 170 BTR-80s were delivered to Uzbekistan and a further 50 armoured personnel carriers were delivered in 2001. Russia has played a part in the repair and modernisation of Uzbek military aircraft on several occasions. For example in 2004 Russia installed equipment on MiG-29 and Su-27 aircraft, which enables them to operate at night and in adverse weather conditions. Uzbekistan is interested in other types of Russian armaments, including air defence systems and anti-tank rockets. The country’s main priority however remains the repair and modernisation contracts for existing technology. Five years ago the Russian-Turkmen arms market was almost non-existent. This was influenced by considerable poverty, the isolationist policies of Ashkhabad and an impressive reserve of armament and technology, which the country inherited from the Soviet Union. However ageing Soviet technology together with an increase in the state budget owing to revenues from the export of gas, have altered the situation markedly. The first contract with a Russian manufacturer was an order for 6 RZSO (multiple rocket launcher) Smerch vehicles. A pair of Mi-171 helicopters were acquired in 2009 as well as 8 BTR-80A vehicles. Turkmenistan’s leaders ordered 1,040 Kamaz trucks from Russia as well as other transport vehicles to serve the needs of the Army. Two contracts, totalling 40 vehicles, were signed to supply T-90S tanks. Russia played a key role in creating a new Navy in Turkemistan, two large Molniya missile boats and 2 Sobol coastal defence ships have entered service. Delivery of a further three Molniya vessels is expected by the end of 2014. Russia has been cooperating with this country since the end of the 1990s, although the supply of armaments on a permanent basis began after the agreement to accommodate Russian servicemen on the Kant airbase in the Chuy region in Kyrgyzstan. Under this agreement, Bishkek receives $4.5 million worth of military support by way of a grant every year. This is divided equally between military equipment and training. In 2003 a pair of Mi-17 helicopters was transferred to the country. As part of additional annual military contributions the Kyrgyz Army received a consignment of rifles, flak jackets, night vision goggles, communication systems and military uniforms. In 2012 under a bilateral agreement on the expansion of the Russian military presence Moscow offered Kyrgyzstan $1 billion worth of military support. The list of military equipment offered for this sum of money was never published, however what is known is what Bishkek wanted. The Kyrgyz Ministry of the Interior requested 2 combat helicopters, 5 armoured personnel carriers, 44 trucks and minibuses, a few hundred rifles, and 40,000 sets of police uniforms. The country’s armed forces would like to receive an unspecified number of armoured personnel carriers, guns, mortars, portable missile defence systems, motorbikes and satellite communication systems. Russian cooperation with Dushanbe comes more by way of support for her military presence than in the acquisition of new armaments. Nevertheless the Tajik Army received two Mi-24 combat helicopters in 2006, and 4 modernised L-39 training aircraft in 2007. It is reported that Russia may send all the old hardware from the 201st Russian Military Base to Tajikistan. This refers to 160 T-62 and T-72 tanks, 160 BTR-70s and BTR-80s and 140 BMP-1s as well as dozens of howitzers, portable missile defence systems and flame-throwers. There is still no information on the fate of this military equipment. The latest agreement on extending the lease of the military base, ratified by the Tajik parliament in October 2013 mentions $200 million in military support, mostly for air defence systems and repairs. First published in Russian in Ruskaya planeta.